Sightseeing Supertips: Sightseeing Amsterdam’s city centre is a unique experience and our channels are world famous. Downtown Amsterdam unites history and architecture to an extend that makes it worthwhile to spend a day or two just walking our city centre enjoying its sightseeing highlights. Most of them are within a minutes walk from the Budget Hostel Amsterdam or the Youth Guesthouse Leidseplein Amsterdam. In this article the best ‘must see’ completely free highlights. Did you also checkout out our articles about Amsterdam’s best budget restaurants and the Amsterdam Festivals? Sightseeing Supertips: The seventeenth-century canals of Amsterdam together, form a neighborhood and so, the center of Amsterdam. They were added to th e Unesco World Heritage List in August 2010 and is an international icon of urban planning and architecture that is still intact after four centuries. It is know for its environment of 17th century canal homes with small bridges over the canals. 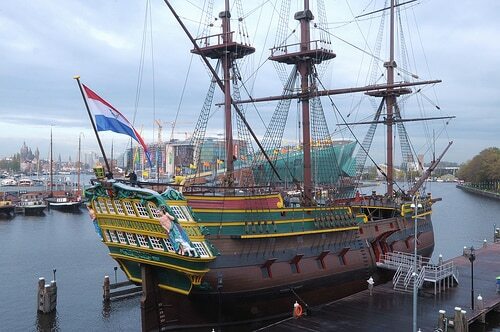 The Amsterdam was an 18th-century VOC (Dutch East India Company) vessel which was used as a cargo ship. The Amsterdam has been moored next the National Maritime Museum since 1991. This boat is actually a replica – the original was wrecked during a violent storm on its way to the Far East in 1749. Besides viewing, you can also visit the Amsterdam with a ticket of the National Maritime Museum (https://www.hetscheepvaartmuseum.nl/).